A meeting place for tempeh battlers, tofu enthusiasts and our veg-curious friends. Spread it on thick why don’t cha? You thought you knew peanut butter. Standing alone in the kitchen with no-one to judge you. Just you and a spoon and a jar of good quality peanut butter — heaven, right? Wrong. You don’t know how good peanut butter can be until you’ve had homemade peanut butter. And one step better than that is the taste and texture of homemade peanut butter without having to lift a finger — or a peanut. Enter Wide Open Road. I believe this Brunswick café and roastery may just be home to the best peanut butter in Melbourne. So now that I have made a grandiose claim and featured the words ‘peanut butter’ more in one paragraph than ever before — onto the dish! You can get your fingers sticky with two giant hunks of Rustica sourdough slathered (thick! the chef may have dabbled in brick-laying in a past life) in house-made peanut butter and topped with fresh banana and agave nectar. A lot of thought has gone into building this simple little slice of heaven. 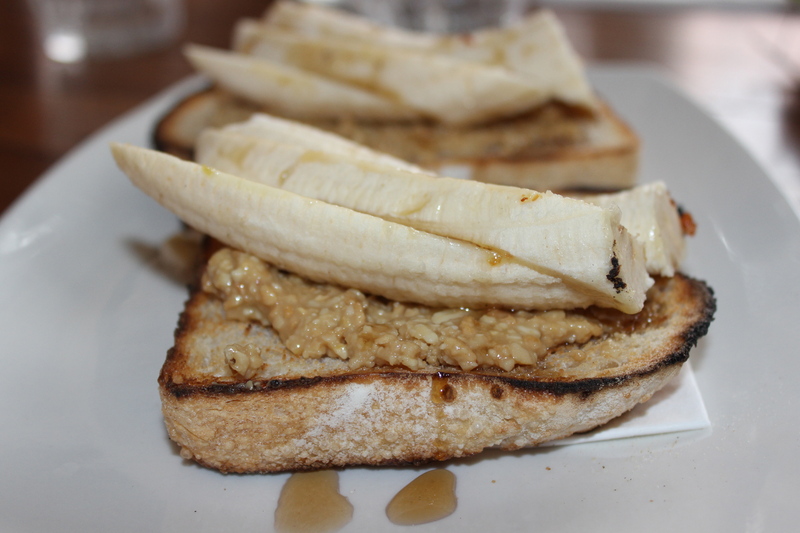 The peanut butter is just the right side of salty to pair perfectly with the sweetness of the banana and agave. And none of that super-pasty-stick-to-the-roof-of-your-mouth-forever business either! Wash it down with one of Wide Open Road’s near perfect Bathysphere blend coffees and you have a very filling, delicious Sunday starter for just over twelve bucks! And the good news doesn’t stop there. There’s a second scrumptious vegan option on the menu. 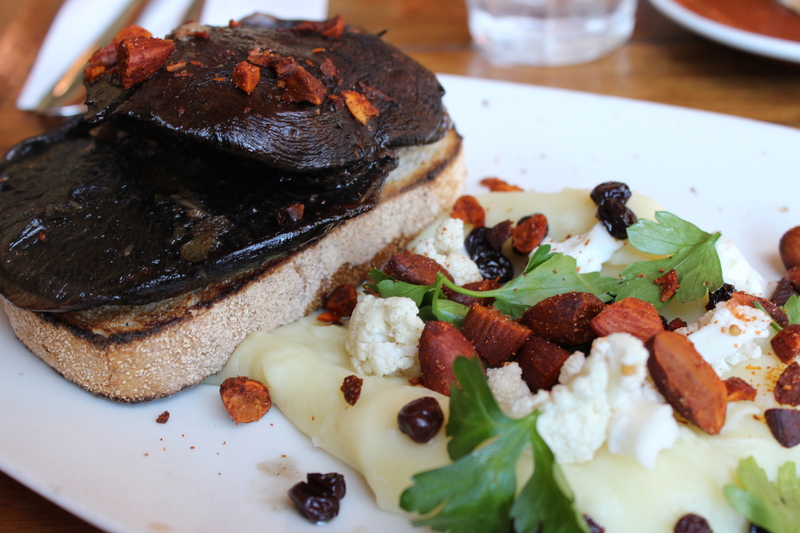 Portobello mushrooms, skordalia, smoked almonds, currants and pickled cauliflower with a slab of Rustica sourdough. Big, fat, juicy mushrooms, crusty bread, creamy potato and garlic puree (the skordalia), smokey almonds, sweet currants, slightly sour and slightly crunchy cauliflower. You guessed it, this dish is a flavour bomb. The textures are great and the flavour combination is adventurous which really reflects the kind of menu Wide Open Road delivers. Add to that great service, a bright and breezy atmosphere and killer coffee and you can see why it’s one of my new favourite haunts. Vegan options: There’s the two you see here and there are also changing specials which may sometimes be vegan-friendly. They also do a vegan slice. Coffee: The coffee is outstanding. The Bathysphere blend is roasted onsite (they supply the same blend to A Minor Place). They also do drip and filter. Moola: $12.50 for the first dish and coffee. Or $20.50 for the fancy mushies on toast and a coffee. Ear candy: Always a good mix tinkling in the background. Where’s your favourite vegan brunch?